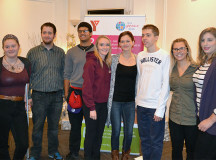 Zak Ebrahim, author of The Terrorist’s Son: A Story of Choice, shared his life experiences at the YMCA of Oakville’s Community Breakfast for Peace. 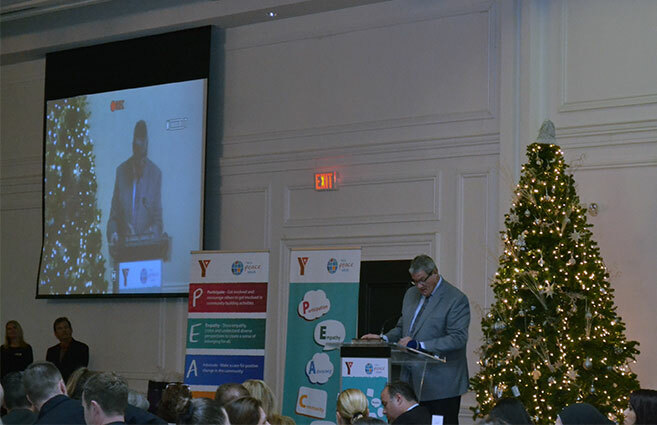 This was one of the main messages Zak Ebrahim conveyed to the audience during the sold-out YMCA of Oakville Community Breakfast for Peace at the Oakville Conference Centre on Nov. 19. 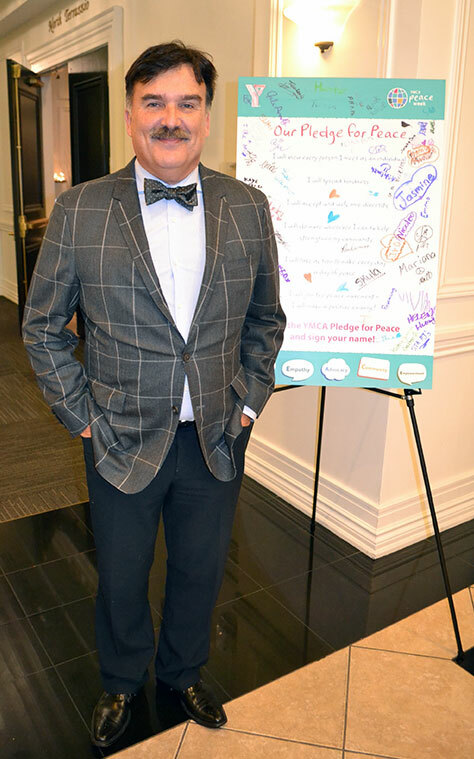 Although Ebrahim’s father was a terrorist who killed the leader of the Jewish Defense League and helped plan the bombing of the World Trade Center in 1993, he promotes peace and non-violence. 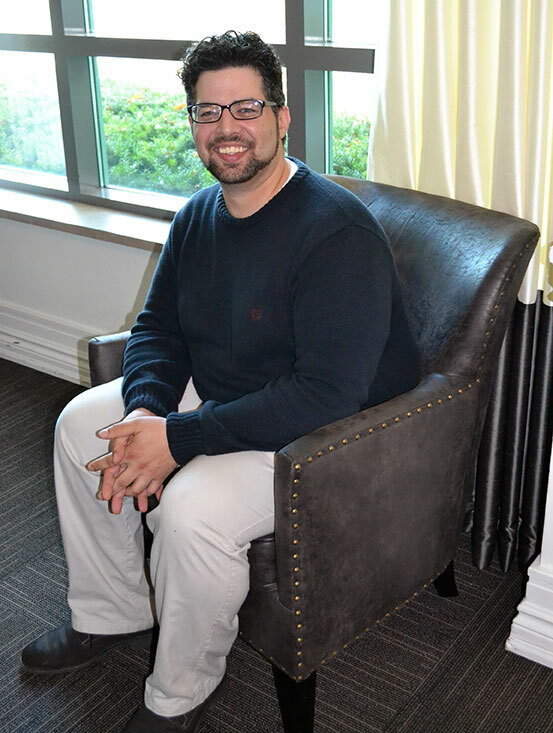 “I’m not my father and with that simple fact I stand here as proof that violence isn’t inherent in one’s religion or race and a son does not have to follow the ways of his father,” said Ebrahim. 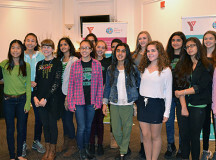 Ebrahim, the author of The Terrorist’s Son: A Story of Choice, was the keynote speaker at the YMCA’s event, which was a part of their annual Peace Week. 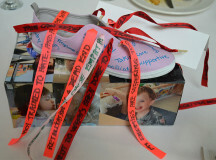 Here’s a timeline of his story. 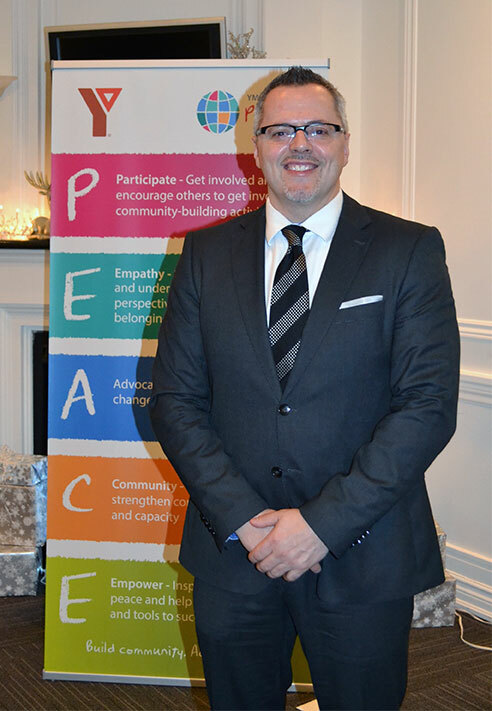 “As we do each year, we dedicate this time to exploring the power of peace and how we can all take action to create a kinder more peaceful community and world,” said Kyle Barber, president and CEO of YMCA of Oakville. 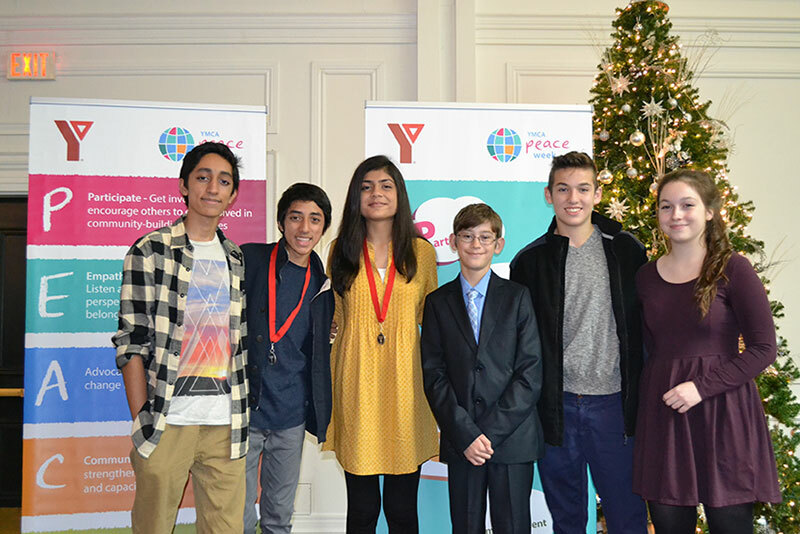 During the breakfast, the YMCA also recognizes a youth, adult and group in their community who have done significant things to help others, by awarding them with the YMCA Peace Medallion. 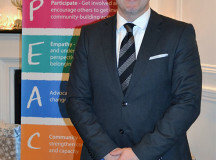 According to Barber, 115 YMCA Peace Medallions will be given out to peacemakers across Canada during Peace Week. 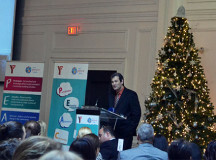 Aiza Abid, a Grade 12 student at Garth Webb Secondary School, was the winner of the youth category. 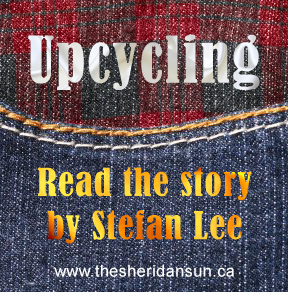 Since 2013, she has been donating stuffed toys and school supplies to ill and underprivileged kids all across Ontario and globally. 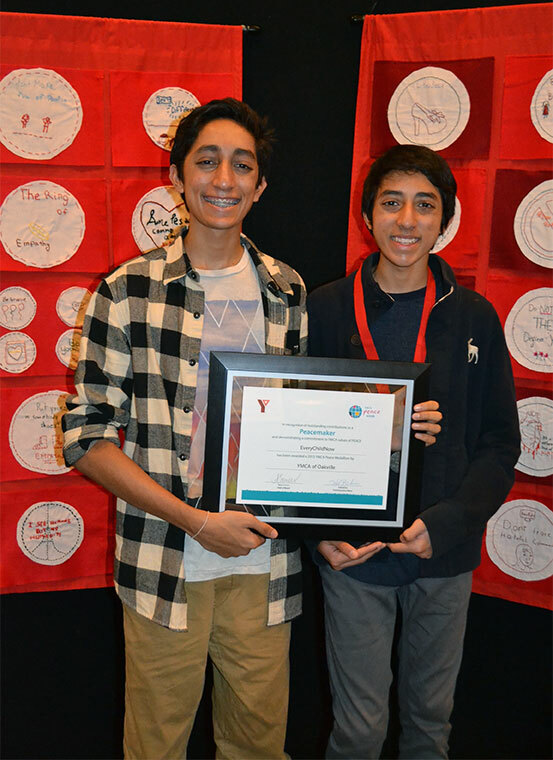 “It actually started off as a project they assigned us in civics class to take action on an initiative of our choice,” said Abid. 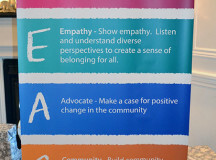 Linda Coghlin, was the winner of the adult category and EveryChildNow founded by Vishal and Ishan Vijay, was the winner of the group category. 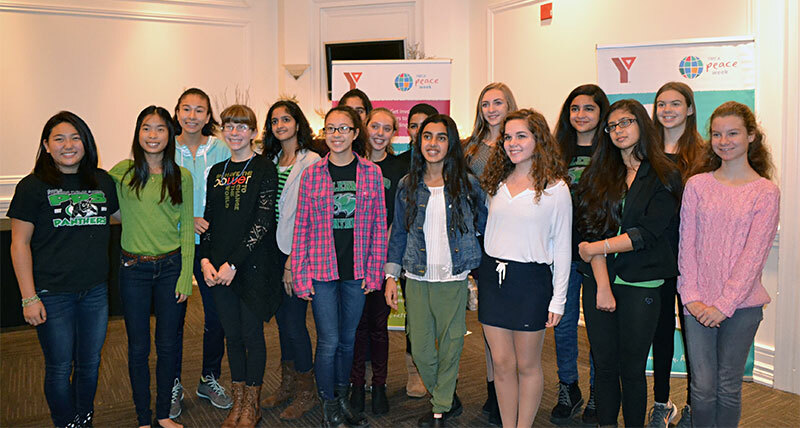 “All of the nominees were just absolutely incredible and it was so hard to choose, but the ones who won today really deserved it,” said Victoria Winslow, 2015 Peace Medallion selection committee member and Oakville Trafalgar High School student. 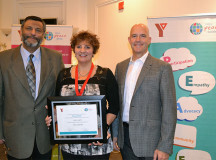 “It was very inspiring to see all the youth of our community doing so many wonderful things,” said Yvonne Iten-Scott. 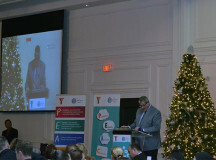 “I think this is a remarkable community event,” said Michael Shaen, vice-chair of the Oakville Y board. 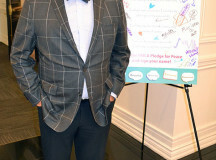 Michael Shaen, Vice Chair of the Oakville Y Board, stands next to the YMCA pledge for peace at the Community Breakfast for Peace. 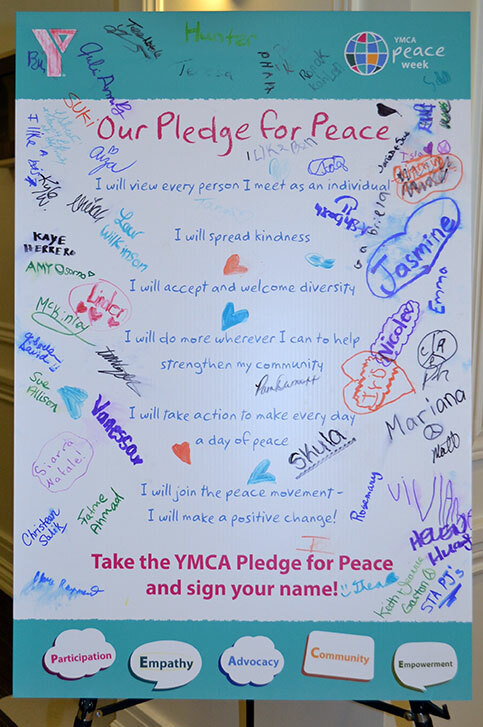 The YMCA peace week pledge for peace is full of signatures from people who will promise to promote peace. 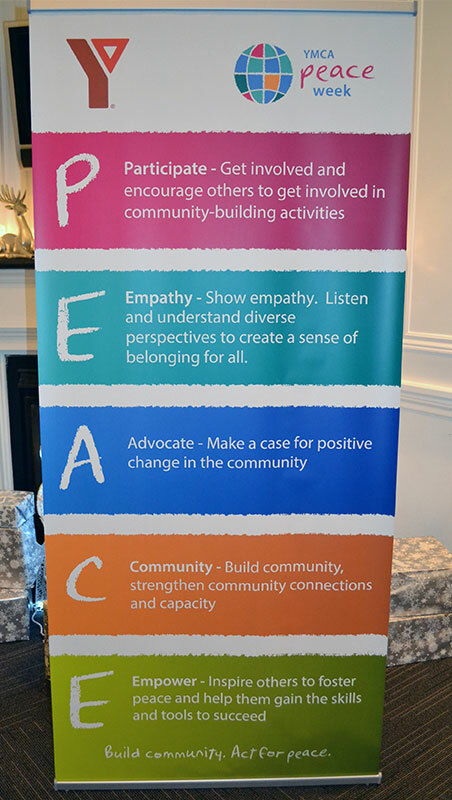 A sign at the YMCA of Oakville's Community Breakfast for Peace informs people that PEACE stands for participation, empathy, advocate, community and empower. 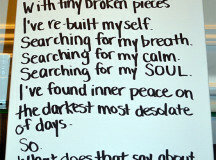 A sign with a short description of someone's journey to find peace. 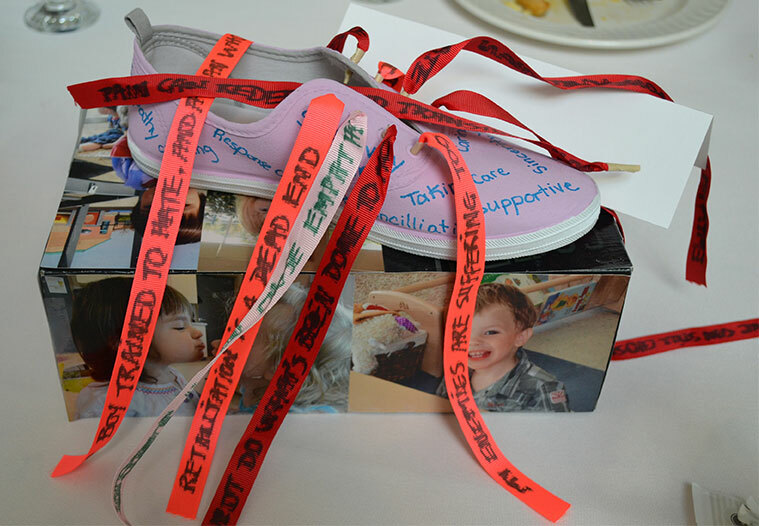 A shoe covered with words of peace and messages of peace and empathy written on the laces were place at the centre of all the tables at the YMCA of Oakville Community Breakfast for Peace. 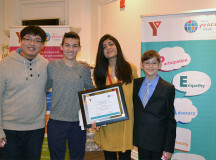 Peace Medallion youth nominees Alvin Leung, left, and Jack Mogus, youth medallion winner Aiza Abid and nominee David Vidicon, right. 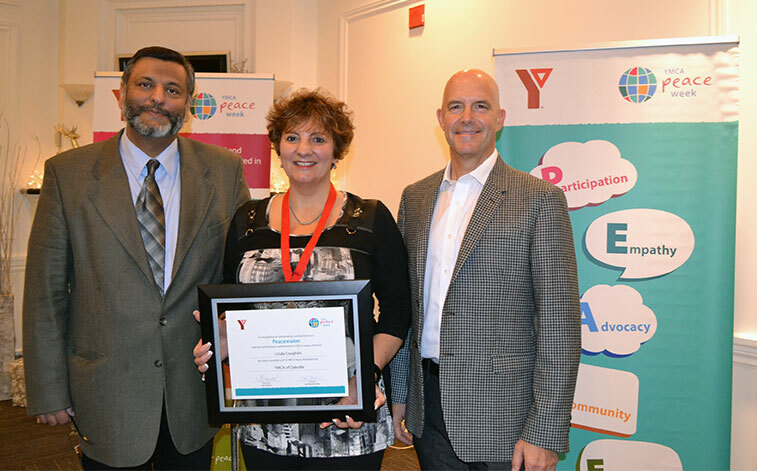 Peace Medallion adult nominees Syed Ali Naqvi, left, Mary Jane Mendes, who accepted the award for winner Linda Coghlin and nominee Peter Kolisnyk. 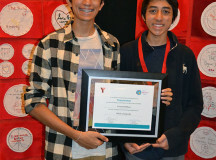 Winners Ishan and Vishal Vijay, founders of EveryChildNow, proudly hold the peace medallion award for the group category. 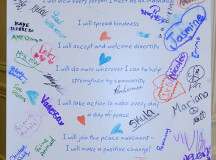 Peace Medallion group nominee Tino Dossantos, Oakville Taekwondo Club, stands next to the PEACE sign at the Community Breakfast. 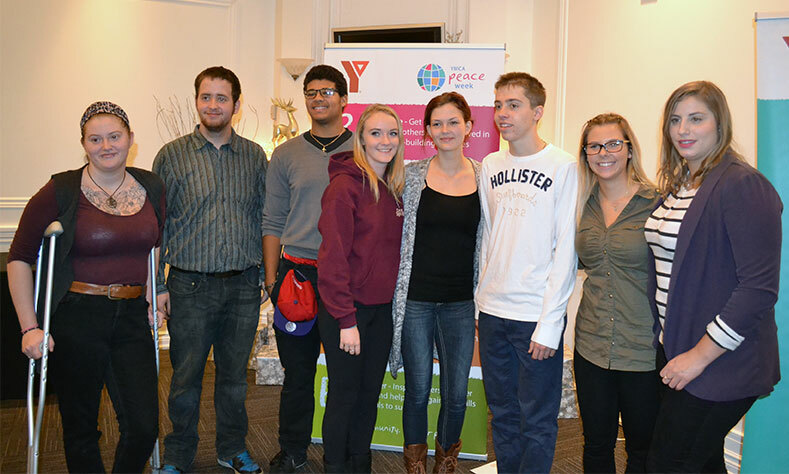 Members of one of the group nominees for the YMCA 2015 Peace Medallion poses in front of the PEACE sign. 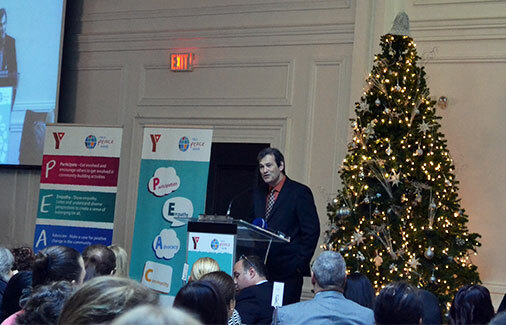 Kyle Barber, president and CEO of YMCA of Oakville closes the Community Breakfast for Peace with some final words about empathy. 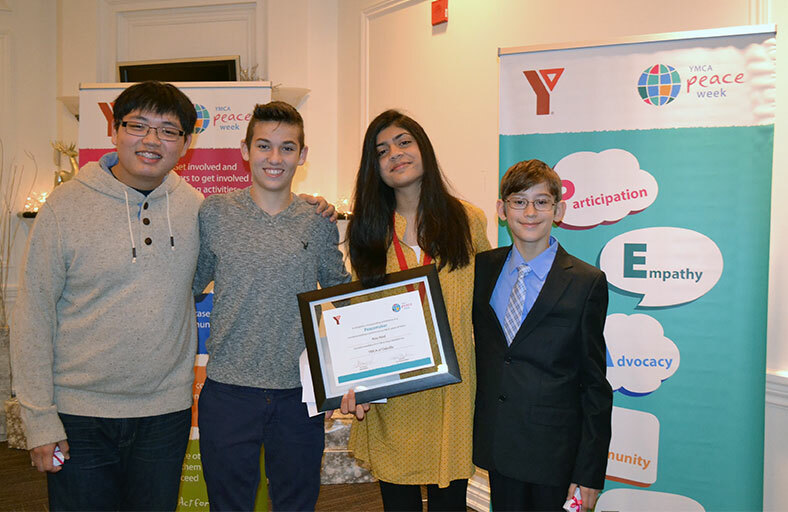 The Oakville Beaver, a community paper and sponsor of the Community Breakfast for Peace congratulate the winners of the 2015 YMCA Peace Medallion and share a message about empathy. 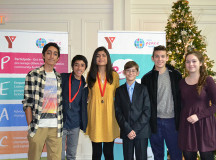 Group medallion winners Ishan and Vishal Vijay, founders of EveryChildNow, youth medallion winner Aiza Abid, youth nominees David Vidicon and Jack Mogus and master of ceremony Emma Mogus. 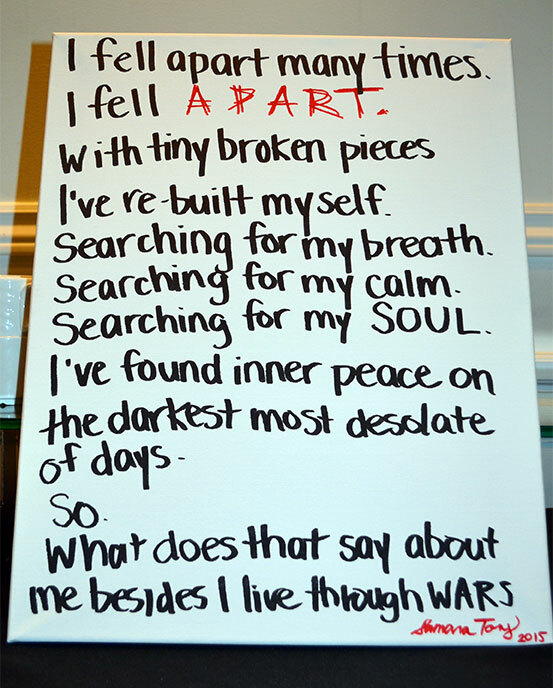 Added by Elise Morton on November 23, 2015.